If Navel Oranges are seedless, How Can They Reproduce? Seedless Navel Oranges seem like an impossible proposition. Without seeds, how can we grow new Navel Orange trees? The chance mutation we now call the Navel Orange was first discovered in the late 18th century in Bahia, Brazil. Along with its seedless interior, this variety had a secondary, underdeveloped orange inside of the same peel which formed its signature navel shape. The Navel Orange was an instant hit, but how would the Brazilian farmers plant more of this delicious fruit? Without seeds, it had no way of reproducing on its own. Bahia, Brazil: Home of the world's original Navel Orange tree. The answer was surprisingly simple. They cut branches from the Navel Orange tree and attached them to closely-related varieties nearby. This process is called grafting. 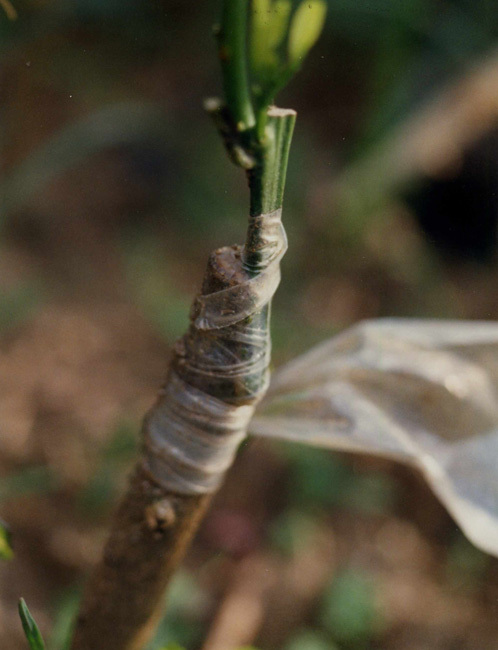 Grafting is the ancient practice of attaching fruitful branches from one tree to the roots of similar trees or “rootstock” by joining them on precisely-cut angles and applying an adhesive to keep them stuck together. The new branch receives nutrients from the rootstock as though it was its own branch and continues to bear fruit. This was first done in China over four thousand years ago and continues more or less unchanged today. Navel Orange Tree, from graft to grove. So, to answer our little riddle: The Navel Orange tree doesn’t need to reproduce. Growers just continue to graft Navel Orange branches on to new rootstock and these branches continue to grow into delicious Navel Oranges! Whether as a delicious snack or a great gift, Navel Oranges are loved by all. Share the love with someone and order Navel Oranges shipped right to you! "Navel Graft" by Chester N. Roistacher provided courtesy of EcoPort.